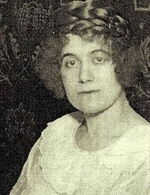 Marie-Louise Giraud, at the age of 39, was guillotined on the morning of July 30, 1943, in the courtyard of the prison de la Roquette in Paris by executioner Jules-Henri Desfourneaux for having performed 27 abortions in the region of Cherbourg. She was the only faiseuse d'anges (French slang: literally "maker of angels") to be executed for this reason. A man was also beheaded the same year for three abortions. Source : © Copyright Wikipédia authors - This article is under licence CC BY-SA 3.0 .